Former CAL FIRE firefighter now troubled man-child Benjamin Cunha, who has volunteered for several fire departments in El Dorado County and hails from a long line of career firefighters, and who was convicted of arson earlier this year has been re-arrested on suspicion of arranging a deal to sell stolen firearms. He had received a six-year suspended sentence on the arson charge and was told he would go to prison if he violated rules of his probation. An El Dorado County judge set bail for Benjamin Cunha at 10-million dollars because his prior record makes him a flight risk. The new charges against him include facilitating the sale of stolen weapons, being a felon in possession of a firearm, and violating probation. 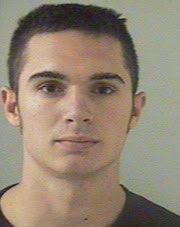 Placerville Police investigators say three men burglarized a home last week and stole two guns. Cunha was not involved in the burglary, but one of the suspects is an acquaintance, and Cunha allegedly told a friend about the stolen guns for sale and orchestrated the transaction. The three burglary suspects have been arrested, as was 25-year-old Eric Summer, the man suspected of buying the stolen guns. Cunha's family members contributed many years in fire service. Cunha was a volunteer firefighter for the Diamond Springs/El Dorado Fire Protection District since 2000. Cunha also has worked as an apprentice firefighter for the El Dorado County Fire District and, from 2001 to 2003, was a seasonal firefighter for Cal Fire, said Phyllis Banducci, division chief for Cal Fire's Amador-El Dorado Unit. Wanted to post a message on this issue. You all need to get a better picture of what is going on here. This is a person who has never had any issues with the law. Devoted his entire life to helping others. As for the arson charges. Yes, Ben pleaded guilty. As I understand it, the evidence was very circumstancial. How many of you would want to face a jury in California on these charges? What are the chances of an aquittal? What choice do you have other than to plea bargen? As for the recent charges. How many murders get a 10 million dollar bail? As for Ben being a flight risk, that is absurd. During his first hearings, the courts refused to put him on house arrest using a tracking bracelet. Why? Ben's situation could happen to any of you. I know those that read this are thinking, well he had to have done something! What you need to ask is why are law enforcement and the courts coming down to this degree on a person that has not harmed anyone, has no crimial record (other than the current issues) and is not a flight risk? Circumstances of the crurrent charges are a lot different than are being reported. As you mentioned. Ben was not involved with the robbery and as I understand it never handled or had posession of any of the firearms. Was is dumb for him to contact some people who might be interested in purchasing firearms (not known to be stolen, and seller provided serial numbers)? Sure, but from what I have been told, that is the extent of his imvolvement.